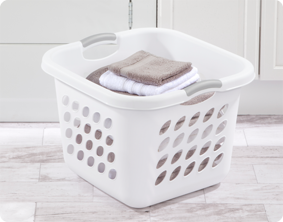 The 1.5 Bushel Ultra™ Square Laundry Basket features a square design that occupies less floor space. The basket offers durable construction and 4 comfortable handles with a grip that make it easy to carry from any angle, making transporting clothes to the laundry room easy. The smooth plastic interior is snag proof and easy to clean, and offers a reinforced rim that will hold up under regular day-to-day use. The hole pattern provides ventilation for the clothes inside and helps eliminate excessive odors. 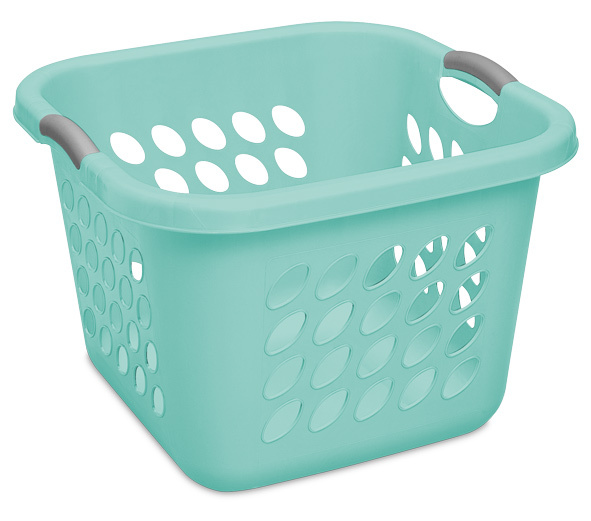 This Laundry Basket is perfect for sorting a full household of clothing, towels or sheets and for transporting laundry between rooms, collecting dirty clothes or storing clean folded laundry. 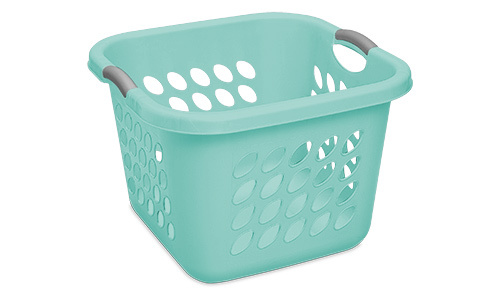 The overall dimensions of this item are 19 3/8" L x 19 1/8" W x 13 7/8" H.
Overall Assembled Size: 19 3/8" x 19 1/8" x 13 7/8"
1.5 Bushel Ultra Laundry Basket is rated 4.7 out of 5 by 28. Rated 5 out of 5 by Pattyb from Love these small baskets, they are so versatile! I have a few of these baskets and they are so much handier to use than the larger rectangular size. Handy to sort and tote clothes around and I keep one in the back of my car to put bottles and grocery bags in so they don't roll around--and you can carry it all inside without making extra trips, put the basket back in the car and you're ready for next time. When I am looking for a new item in the plastics category, I look at the Sterilite items first--usually end up buying one of them--they really are the best! Rated 5 out of 5 by Nancy49 from This is a great product. This is the perfect size for me. It is durable and easy to carry . I can fit two loads of folded clothes in this basket. Rated 5 out of 5 by Organizedbyerika from PERFECT size! I bought a basket for each of my kids and set them on a shelf in my laundry room. As soon as the clothes come out of the dryer I sort then into the individual baskets and my kids fold theiir own laundry. Lifesaver! Sturdy, inexpensive and the perfect size! Rated 2 out of 5 by engineerssolveproblems from love the feel, hate the handles (after they break ...and they always do) Basket handles are the weak link in this product, we have 4 and only one still has both handles attached. Wish they had just molded the plastic into a handle . The 2 piece approach used fails right at the point where it connects to the basket...given how well the rest of the basket takes the load, it is a waste as without the handle it is just useless. Rated 5 out of 5 by dje2070 from Very Useful This is one of the strongest laundry baskets ever. It does come in other colors. Easy to hold and doesn't crack! Rated 5 out of 5 by Becca273 from A useful little basket & well designed product! Sturdy, compact and easy to carry. This basket is versatil, it has other uses other than for laundry. I use it as storage in the van for my kid's toys, to carry groceries and of course for laundry. ***Bonus*** I wont hurt my back carrying it even if it is full to the brim! Rated 5 out of 5 by RadarRecon from PREPPERS - CHECK THIS OUT. Excellent size for carrying nine 2-liter (soda) bottles which I have filled with rice or beans. Stackable 2 high, but may be a bit shaky (the bottles are not squeezed together), and sturdy enough to carry them. They're good for laundry, too. Rated 5 out of 5 by Nakima from The Perfect Laundry Basket This is the perfect laundry basket. Not too small, not too large. Sturdy. Because of its size, even when full to the brim, the weight isn't too much. These baskets also make the perfect carry-alls other than laundry. On road trips, I have a basket for shoes, a basket for blankets and pillows, and a basket for jackets. When we go to the snow, they're the perfect place to throw in all the wet, muddy clothes. Because they're plastic, they're easy to clean. They're sturdy and won't bend under the weight of a full load of clothes. I have about 10 of these and wouldn't want to do without. My only complaint is they don't make these in more colors. It would be great to see them in orange and yellow and green and blue. I love all my Sterilite products, namely bins, and on top of all the great uses of the laundry baskets and bins, they're also made in America!! I love that. I love buying made in America products and everytime I buy another Sterilite product, I think, "I'm helping U.S. workers stay employed." That's important to me and I wish more companies were "made in the U.S.A." manufactureres. Keep up the great products, Sterilite. I am a lifetime customer.